Kappa Mountain is the largest mountain on Yoshi's Island. It first appeared in Super Mario World, in which it was the location of the Yellow Switch Palace. The name Kappa comes from a mythical creature in Japan, which has a water-filled, bowl-shaped depression on the top of its head. If the water runs out, the Kappas die. 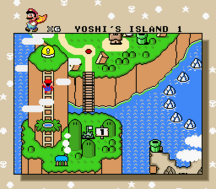 The lake in the middle of the mountain in Super Mario World looks like the head of a Kappa, and the whole mountain could be thought of a Kappa lying on its underbelly. This page was last edited on July 16, 2018, at 11:07.